Book+Main is a Chicago-based business building a platform that's changing how readers find books and authors find readers. 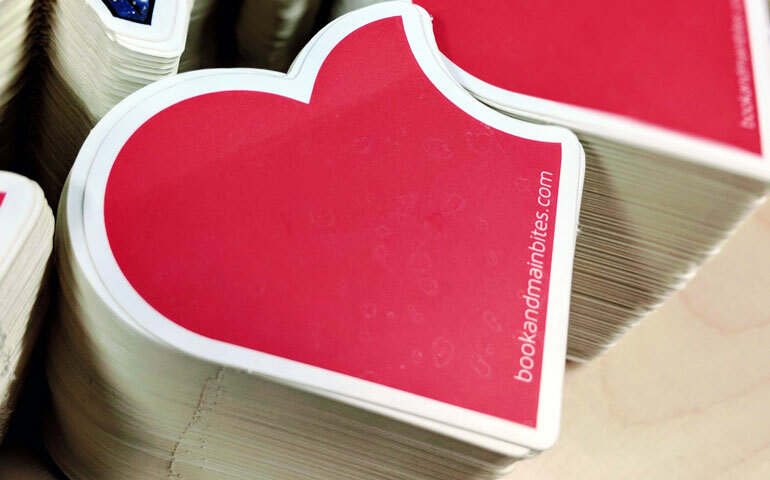 To help promote Book+Main Bites, they printed up a matte die cut sticker with their logo and website address to create brand awareness for this fresh, exciting service that connects readers to the authors and words they love. Book+Main Bites is a content-based social media community that lets readers follow their favorite romance authors and discover new ones, every single day. From debut authors to New York Times #1 best sellers, Book+Main Bites is where the book world comes to connect. They have a free offering for readers and paid product for authors, with selling tools and community platforms to connect with readers and other authors. There's an iOS app and an Android app to experience all that you love about the romance writing world on the go. Bites are short stories that you can read, like, comment on, and share. From excerpts to deleted scenes and post-epilogues to brand new stories from an author's current Work In Progress, Book+Main Bites is THE source for the best, freshest content from published authors on the web. Their custom shaped heart sticker, with a small bite taken out, really helps reinforce the overall branding of their website, which uses the red color and the heart shape everywhere. By giving a portable piece of content in a social media driven world, Book+Main will help get their message out with a finely crafted sticker design. They have new genres coming out, so there will be even more fresh content around other literary genres. Follow Book+Main on their blog, or head over to social media to check out their Facebook, Instagram, LinkedIn and Twitter as they grow their brand. Book+Main and their Bites product is just one example of the many ways you can use your logo with stickers to help get the word out for your brand. We have a few different custom sticker options, so you can fully customize your's just like Book+Main did with their unique die cut stickers. You can also choose one of our other standard shape options, like a custom circle sticker or a custom square sticker. No matter the matter idea, a custom sticker can be used as a call to action to drive website traffic, like you see with Book+Main Bites, or it can be customized for a specific campaign or product release. All it takes is your story.